As You Sow tackles some of the most important environmental and social issues facing the world today. Read about our programs below, then click through to learn more about our efforts to hold corporations accountable. We seek to protect children, families, and communities from the toxic byproducts and carbon pollution caused by burning fossil fuels for energy, and to ensure that the cleantech industry is not only clean, but green. The Energy program engages companies on issues relating to climate change, coal, and hydraulic fracturing. We press companies to address the health and environmental risks of toxic materials often found in food and consumer products. We also test products for known carcinogens and reproductive toxicants under Prop 65 and engage in litigation with companies to remove harmful chemicals from everyday consumer products. The Environmental Health program engages companies on issues relating to antibiotics and factory farms, genetically modified organisms, nanomaterials in food, smoke-free movies, and toxic enforcement. We advocate for responsible production and recycling of consumer products, packaging, and electronics to reduce the demand on limited natural resources. This program area is building momentum under the international standard of extended producer responsibility (EPR), which shifts the responsibility for collecting and recycling to producers, thereby incentivizing companies to create more efficiency and less waste. The Waste program engages companies on issues relating to consumer packaging and electronic waste. If you own shares in a company, you have a voice. 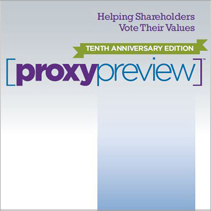 Our Power of the Proxy program leverages the power of stock ownership to promote social change. The program includes a new Executive Compensation initiative, as well as our annual Proxy Preview report. We work to eliminate forced child labor and slavery in the cotton fields of Uzbekistan and the mineral mines of the Congo. This program area is run through Responsible Sourcing Network, a project of As You Sow, and creates change by building coalitions of companies, investors, non-governmental organizations, and other stakeholders to share best practices and take coordinated action.